Admit it, sometimes your kid can be a bit of a handful. In fact, there are times when you wonder whether she’s a kid at all or really a little monster. Oh, most of the time, she’s pretty well behaved—nearly angelic, really. She does her homework and finishes her chores and plays with her little brother. It’s a terrifying transformation, and it’s completely unpredictable. One minute, she’s doing the dishes. The next, she’s running through the house with manic energy, shouting, slamming doors… There has to be a reason, but what? The three bottles of soda she chugged? The two bags of candy that she inhaled? The scary movie she watched last night? The rock music she listens to? Whatever the reason, there are times when the neighborhood isn’t safe anymore, when your kid prowls the night, her howls ringing through the streets. It gets worse the closer it gets to Halloween. And heaven help you… Halloween is tonight. If your little terror wants to act like a monster this Halloween, why fight the inevitable? Instead, help her along with these Kids Furry Boot Covers. 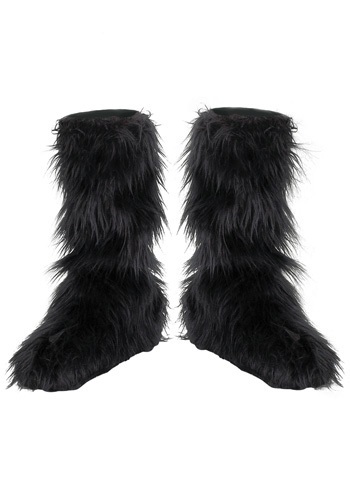 The black acrylic and polyester blend faux fur boot covers will complete any monster outfit, whether she wants to be a wolf man (wolf girl?) or a Big Foot (Little Foot?). Just be sure to keep a wary eye on your bowls of candy… for the sake of everyone.